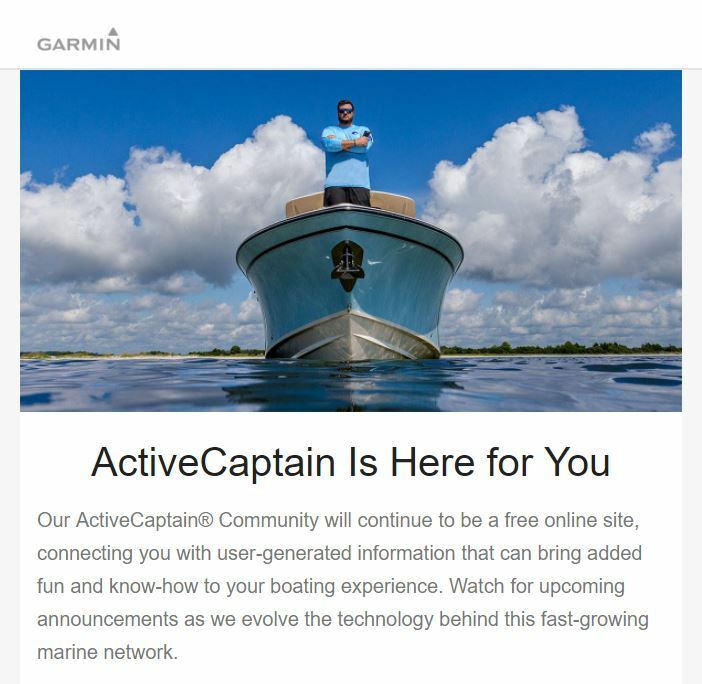 Back in April Garmin announced that the Navionics apps would be getting ActiveCaptain Community (ACC) support by the end of 2018. With not too many days left in 2018, it appeared time might be running out on that promise. But today two v13.0 app updates supporting ACC were released to the iOS App Store and Android’s Play Store. However, many Navionics Boating users may find that their particular app does not update to version 13. Apparently that’s because Navionics is also using this major feature addition to discontinue older editions of their charting apps. But the solution is easy. If your updated Navionics app doesn’t show Active Captain, iPad and iPhone users need to install Navionics Boating Marine & Lakes while Android users get Navionics Boating HD Marine & Lakes. In both cases, you then just log into your Navionics account and all your old routes and tracks will be synched. You’ll also get access to charts in whatever areas your old app(s) was subscribed to, but you will have to download them again if you like having them always available. 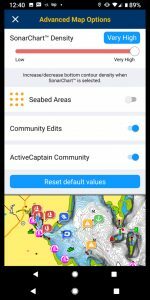 Version 13.0 of the Navionics Boating Marine & Lakes app nicely displays all of the ActiveCaptain Community data and the app allows editing of data by taking you to the ACC website. I’ve just cruised through the app pretty quickly but so far the ACC data is nicely integrated into the already excellent Navionics Boating app. 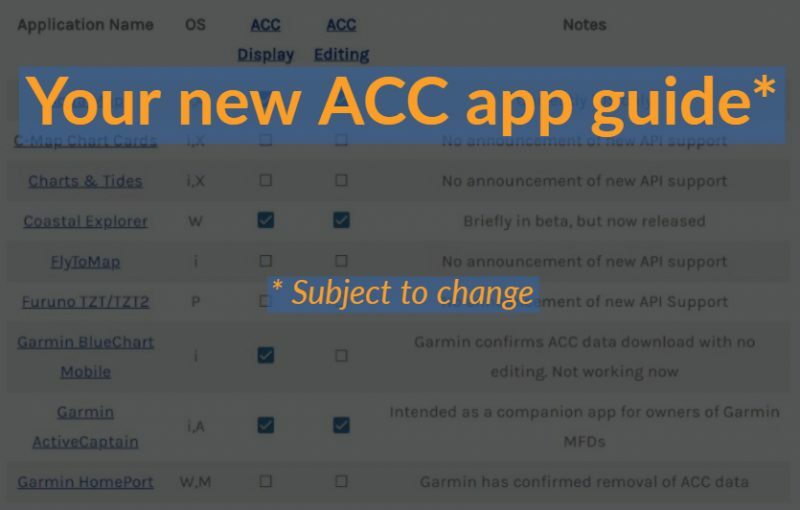 As soon as the updated app is launched it begins downloading the ACC database. Like several other apps with ACC support, no login is required to enable ACC. I suspect Navionics will add more integrated editing over time but this looks like a very good start and it’s nice to see Navionics meet the end of the year commitment. The top two iPad screens illustrate how many Navionics Boating apps are now marked “This App Will Be Discontinued!” but Navionics Boating Marine & Lakes has a fresh Icon and also the v13 update that includes ActiveCaptain Community support. And similar is happening on the Google Play store except for Navionics Boating HD Marine & Lakes. If you own an app on the way out just install the new one and log in to get your route/track data and chart access back. There may be charges if your old chart area doesn’t fit easily with the current subscriptions, but I paid nothing more to switch USA and Carribean subs. Meanwhile, the first Android (Google Pixel 2XL) screen shows how ACC overlay can be turned on/off via Menu/Chart Options, just like Community Edits. But the final screen shows how both can sometimes be useful, though that’s written by the guy who created these Camden Harbor warning edits in two different places (and much of the SonarChart data too). Ben, I only see version 11.0 in the App Store. How do you get the new version with AC? for 4+ years from Canada to the Keys and Bahamas. I’m one of the odd balls who does not think AC is all that great or useful,but I don’t mind that it is added. BUT it appears that they are going to stop supporting the App I am presently using. Not at all happy about that. I use Navionics US and Canada HD,I went back out to the play store for the version I installed and there was an update button. After I selected it the new version was downloaded and ACC was added. FYI – Active Captain does not show up on Navionics web app though. Alas, for those who would like to see AC data on their nav display, no joy 🙁 I can see AC on my fone with Aqua Map, but I do dislike looking at the world thru a knothole. This is a little confusing, possibly because Ben Stein discovered the change as it’s happening. Those apps are at version 13 and also have a slightly new icon/logo with lighter blue waves at the bottom. And note that all the other apps are going to be discontinued. At any rate, Ben S didn’t quite get the dimensions of this change when he wrote the entry, and is driving back to his boat right now, but there really is a Navionics Boating app with ActiveCaptain. I’m going to confirm that the I can log into the new apps just like the old ones, and then edit the entry. Cool. As soon as I logged into the newly installed “Navionics Boating Marine & Lakes” app on my iPad, it had all my old routes and tracks, and I can download charts from anywhere within the two subscription areas I have (USA and Caribbean & South America). Right after the install, the ActiveCaptain data automatically downloaded just as Ben S described, and there’s a new Menu/Chart Options switch that let’s you turn AC overlay on and off just like you can Community Edits. Looking good! And ditto for “Boating HD Marine & Lakes” on my Android (Pixel 2XL) phone; it too has access to all my data and subscriptions. 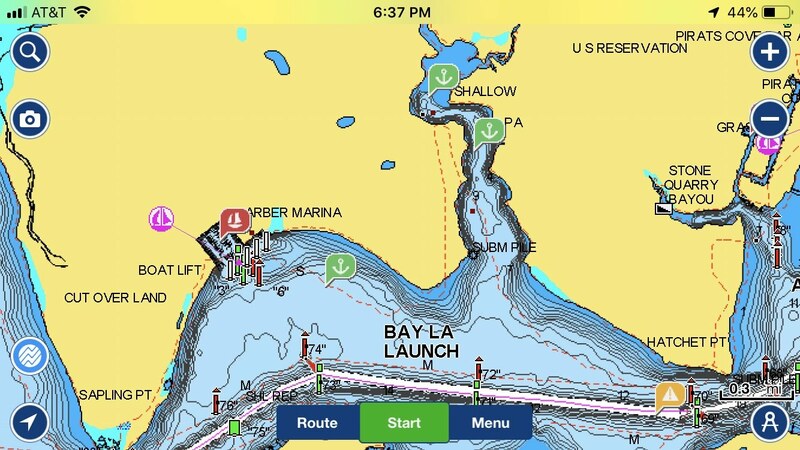 I guess there are some folks out there who were already using one of the newer Navionics Boating apps, but the rest of us have to switch over. There is a plethora of “Navionics” aps in the iPhone Ap Store – some of which are subtly labeled “This ap is being discontinued” – others are segregated by area (US, Europe, etc.) So I downloaded the “Boating Marine & Lakes”, which is at version 13.0 for a “free trial”. I logged in using my Navionics login, but while it identified one of my two chart card subscriptions, it still wants money to continue working beyond the 15 days. 🙁 I asked the nice lady at Navionics about this, and she confirmed that the Ap is an additional subscription over & above the chart cards. I think I’ll stick with Aqua Maps for my fone. Right, but that’s not a change. 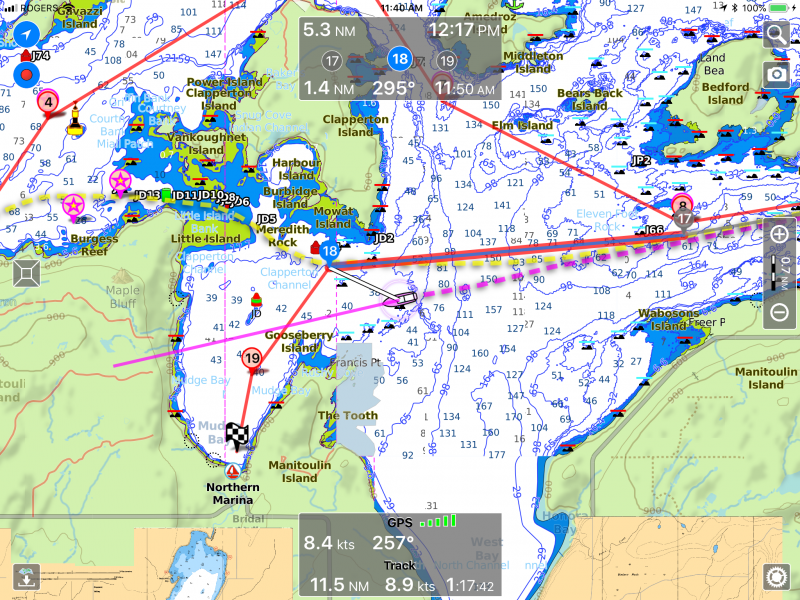 Navionics has always charged separate subscriptions for the app charts and for updating their chart cards. It would be nice if one chart area subscription included both MFD and app support, but then again you get a whole lot of charts and valuable features for each of the two current subscriptions. Be careful what you ask for. I for one like the a la carte pricing structure compared to how Garmin charges for Garmin charts. That said, I pay for Navionics updates on my chartplotter, phone and tablet. Went to the App Store, which offered an update to my iOS version ( I do NOT allow auto-updates). Did that. When I opened the app, I got was a notice that Navionics would no longer be supporting my version of the App. Then directed me to DL the new Marine and Lakes. I declined at first and opened what should have been the updated app but saw nothing in any menu RE AC. So I restarted the app and went forward with the DL of the “New” app. DL went fine, Install fine and the first thing I saw was a notice that all my charts etc were transferred then a banner at the bottom saying Downloading Active Captain. A minute later I have all the AC Icons on the chart and all the data!!! Now on to my Android! Checked the Updates on my Play Store app and saw and did an Update for my existing Navionics Boating App. Opened the updated app and got the same messages re keeping charts and data as on my iPad. Did the DL and install of the new Boating HD Marine and Lakes version of the app. Same exact procedure/results. I now have AC running fine on both my iPad Air and my Galaxy S7!!!! Now I have not been out on the water with this new app/data/AC, just sitting here at Sunset Bay in Stuart, but so far, so good. Can you say happy camper? For those of you that didn’t get the update offer, might be that if you are not running the very latest version you won’t be offered the update/switch to the new app…. Thanks and good to hear, Doug. But I don’t think anyone has to worry about getting invited or told to download a new app. That didn’t happen to me, so I just went searching for the Navionics Boating apps that had actually been updated to v13 (with ActiveCaptain). I’ve put those links up in the entry now, and we also have an email out to Navionics to make sure we’re not missing something. I have just been able to down load the new Navionics app and Charts. Previously I had USA and Canada HD. Not sure what App I have right now, but Navionics migrated all of my personal content, tracks and routes to the new app. What I now have with a $25 upgrade is all of USA, and Canada and the Bahamas. I have been using the sonar charts for years and 10s of thousands of miles. Along the east coast, particularly in the ICW they are the only charts with any sort of up to date bathymetry. The are far better than NOAA which by extension means all the other apps using NOAA charts such as iNav-X and AquaMap. In fact, the only reason i had Aqua Map was for the AC content, which I now have in Navionics. And, in ht e NAvionics app I had previously ,i had charts for the Bahamas. These latest Navionics charts appear to have all of the Explorer Chart routes now too. This seems like a heck of a bargain to have all of USA, Canada and the Bahamas!! 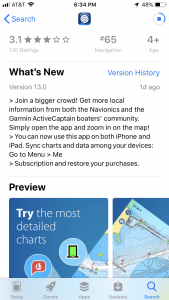 …because that’s the only Navionics Boating app in the Apple app store that’s updated to v13 (with ActiveCaptain) regardless of iPhone or iPad search. That grounding took place because a really experienced skipper was using SonarCharts as their primary nav chart. It did not include the 3-foot ledge that NOAA had been charting at that spot for well over a century. And that shouldn’t be a surprise because there are few cruisers who would purposely go over a danger like that just to collect SonarChart data. It’s great that SonarCharts have become very useful for places like the ICW, and it makes crowd-sourcing sense (until a gunkholer like me starts wandering outside the ICW channels), but even Navionics cautions boaters to use them as a secondary source and to trust no single source. I updated to Navionics Boating Marine and Lakes on both my iPhone and iPad Mini. That went well, and the new version seemed to know what regions I was using in the old apps. However, I went for the 15-day free trial. What will happen after 15 days, and how much will it cost? The 15-day trial is for new users who have not purchased Navionics app charts before, and you have to log into your Navionics account for your purchase to be recognized in the app. Incidentally, it’s confusing that Navionics uses both “Purchase” and “Subscribe” but it does sort of makes sense. During the subscription period, you can download and update charts in the subscribed area as much as you want, but if you don’t renew the subscription you only get to use the charts you already downloaded — the ‘purchased’ part — and you lose some features like Dock-to-dock autorouting. Ben, I use SonarChart a lot but it can be very wrong in places, especially where there are few boaters traveling. The most recent example is in crossing St John’s River by Jacksonville going south into the ICW. I have a screenshot of SonarChart showing I was in 10 ft of water at MLLW and yet I’m on the bottom in my 4′ 9″ sailboat! With enough groundings, SonarChart may catch up but I hat to be the guinea pig. And this is an area with lots of boat tracks. My question: To my knowledge, the Navionics app does not support importing or exporting of routes, waypoints, or tracks unless a compatible chartplotter is used and even then the transactions have to go through the chartplotter, they can’t originate at the app. Am I missing some capability I don’t know about? The download link isn’t working for me right now, but I recall an .xml file that can be imported into other charting programs. The view link should show you the autoroute I just created in regard to Mike’s comment below. Ben, the link has never worked, I’ve tried it several times over the last year, starting when I did the 14 nav app evaluation. When I called Navionics about the problem I was told that the app does not have the capability to import/export routes, waypoints, or tracks. It makes perfect sense, they are in partnership with MFD manufacturers and they are not going to undercut their partners – I don’t blame them for that in the least. It’s a good business decision just like Garmin’s decision to remove capability from BCM. I fully expect movement in that direction on the Navionics app given Garmin’s takeover. Navionics is like a drug. it makes you feel good, especially SonarCharts but it has side effects. You pay a price in addition to the $25/year subscription. You get locked into their systems. You can’t export or import and you build up a dependency on the app – all the past routes you manually or autorouted, the tracks you recorded, waypoints, etc. They all sync between instances of the app but you can’t export or import nav any info. You’re locked in, totally dependent. If that’s all you want, you’re fine. Hak Pomeranz and I were very interested in the dredging progress through Dawho River, east entrance. The dredge is clearing a 125 ft wide path (at most) through the mud fields by following the original, meandering ICW channel. I created a GPX route based on the centerline of the old ICW channel. It was given to a boater who was asked to follow it to see the results of the dredging. Most unfortunately, all he had was the Navionics app. He wound up manually placing a few waypoint pins here and there along the route (the waypoint pins were the only way to place pins that could be moved to a specific Lat/Long). So as he traversed Dawho, he did not have a route to follow, just a few waypoint pins that he thought was enough. He wound up missing all parts of the dredged channel. This is going to be a common occurrence for boaters going through there. 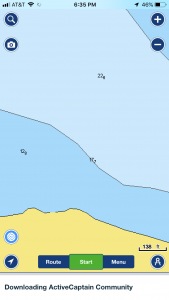 A GPX route showing the path would be simple but Navionics cannot handle it and the dredged channel does not show up on SonarChart, boaters have to find it first to give any feedback to Navionics. So my original statement stands (I wish it was not true, please prove me wrong), the Navionics app is a crippled app – it doesn’t communicate with anything other than itself – the copy your own. I may be wrong here but I don’t even see any way it can export/import to other Navionics apps owned by other boaters. Therefore, I run Aqua Map ($25 for lifetime updates) which exports and imports routes, waypoints, and tracks in both kmz and gpx formats using the full range of sharing options provided by Apple iOS and also on Android. I can turn on Aqua Map in the morning for recording a track and even remove it from the screen and it will record a track in background while I navigate with whatever app I want, including SonarChart. At the end of the day, I know exactly where I went and can export it for use by other or create a route based on the track. Navionics can do none of that. 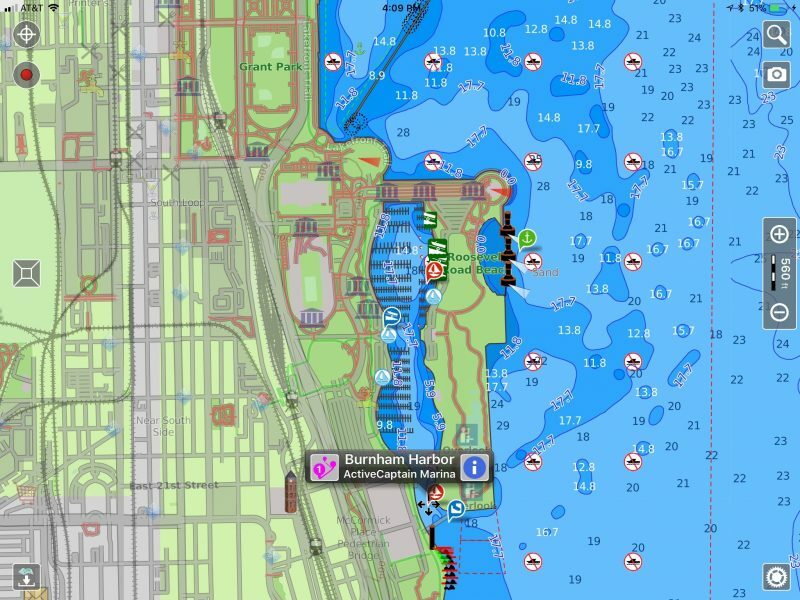 Aqua Map also has both Active Captain and Waterway Guide markers, your choice or use both. for information. I admit it’s a very clever strategy by Navionics to build dependence. If you ever do find out how to import or export anything out of Navionics, please let me know. Bob, How many boaters ever export or import a route? One in twenty-five? One in a hundred? Even if it’s the former — in other words 4% of users, which I doubt — lack of export does not equal a “crippled app”. Hell, I am the sort of skipper who knows about exporting and using .gpx and .klm files, but I’d really rather not make that part of my regular navigation routine. And I use the Navionics Boating app a great deal because it has a lot of great standalone features, especially Dock-to-dock autorouting, which no other developers have come close to in my experience. I also think that you are off base about all the strategy you picture behind Navionics feature set. Has it occurred to you that Navionics and other companies may not put a lot of energy into data export/import because few customers care about it? Ben, this fall I recorded my tracks for the ICW from Norfolk to Titusville, FL and made them available for downloading to readers of my blog and Facebook page. During the height of the migration, the track downloads were averaging around 500/week. I received many personal thanks for making the tracks available. Likewise for GPX routes through many of the shallow spots. Finding an 8 MLLW path through Dawho was only possible using one of the GPX routes. Until recently, the same condition applied to Fernandina for a 12 MLLW path. Users of Navionics app could not use them. BCM, iNavX, SEAiq, iSailGPS, Aqua Map, I Boating, not to mention all the PC based Nav propgrams can import and export GPX files as well as all MFDs. So yes, I would call the Navionics app crippled. It can’t do what is a basic function of all other major Nav app or PC program, use GPX files. Again, it makes perfect business sense for Navionics – it would be trivial to add that capability but could affect the sales of their partner MFDs. … you’ll see that when Navionics routes are Plotter Synced to an MFD, they become GPX files that can be further shared with PC programs etc. I have Dock-to-dock routes that were batch imported into Coastal Explorer and CE-built routes that went back to my Navionics cloud via plotter sync. I think that your ICW guidance is great and imagine it must be frustrating that the GPX part doesn’t work easily with an app as pervasive as Navionics Boating. But please don’t lose perspective. As for your business theories, consider this: Navionics sells its excellent and unique Dock-to-dock autorouting through its partners — Raymarine, Navico, and Garmin probably coming soon — as part of its chart card purchase and subscription program. But it also sells (arguably) easier-to-use and fuller-featured Dock-to-dock autorouting as part of its much less expensive charting app purchase and subscription program (with automatic backup and syncing across Android, iOS, and WebApp browser included). Do you think that GPX import/export in the app could “affect the sales of their partner MFDs” more than Dock-to-dock? 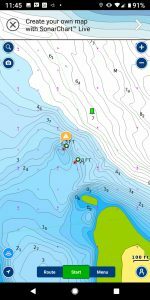 Bob, I found an example of the “all routes” GPX file that gets downloaded to a Navionics chart card when you sync a plotter with the Boating app. Ben, Thanks for taking the time to respond. Navionics is an excellent app, I use it at the helm as one of my nav apps. I “invented” rationales as to why they don’t support GPX transfers because I could not think of a rational reason why they would not. It is obviously within their capability for such a talented company. As you pointed out, they do support GPX transfers if you buy a compatible chartplotter and that’s fine but it adds more steps in sharing GPX files, some of those steps are rather involved., not to mention the additional cost. I tried the chartviewer you gave the link to and my routes were transferred once I signed in – great! However, my tracks and waypoints were not transferred and I still do not see a way to import or export GPX files except by interfacing with a supported MFD. Even the Garmin AC app allows the importing of GPX routes which is an easy way to get them into a Garmin MFD via WiFi sync. I think this thread has run its course, always interesting to talk. I had no problem getting the upgrade and all my charts cane over. But I seem to have a new problem on my iPhone X. When I try to click on an icon on the screen, the cross pointer is no where near my click and often disappears when I try to move to the desired icon. The new app seems to work ok so far. It appears the same as my old free app I use with gov’t charts. However, there a few annoyances. To look at a tide or current table takes six clicks and some scrolling vs. three from the old Blue Chart mobile. I tried the auto routing from Charleston to Cape Lookout, easy right? It took me inside to the next obviously unsuitable dangerous inlet and wanted me to exit there rather than the huge, all weather Charleston Inlet. Needless to say I don’t think I’ll be relying on auto routing. Navionics advertises how wonderful it will be to sync your chartplotter charts, waypoints, updating, etc. with the app (with compatible plotters.) I pay $600/year to update three Navionics Platinum+ charts. But now on top of that I’m asked to pay an additional $24 for the app and $15/year for its updates and continued use of its bells and whistles. It may not be a lot but I do feel like I’m being nickle and dimed just to get Active Captain. Hi Mike, I used the Navionics Web app to build a Dock-to-dock route from the Charleston Municipal Marina to the Cape Lookout anchorage using a boat draft of 5-feet, and it came out quite well. I did add a couple of manual waypoints because I’d rather not cut the long shoals quite as close, but the Navionics auto guidance was not unreasonable. Also the ability to edit the autoroute is one of its many excellent features, in my opinion. I generally like how Navionics uses marked channels in many places like Charleston Harbor, but isn’t shy about cutting out of ship channel when there is plenty of depth available along the rhumb line. That looks like the same route, and the URL is identical – didja get ’em mixed up? Thanks. I hadn’t played with it enough to edit or manually add waypoints so, it could speed up route making and lay it where I want. It looked like your Charleston route did make use of the hereto unknown “amphibious” feature.  On the Android app, Active Captain reviews are limited to the latest 10 reviews. I am hoping that will be fixed in a later release as I find that significantly limits the value of Active Captain integration. I’m seeing the same limit of the 10 most recent reviews being shown. I agree, that’s a serious limitation. I’m hopeful we ought see that changed to being paginated at 10 reviews. 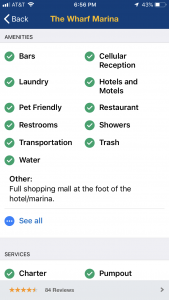 After some thought, I am wondering if the limit of 10 reviews is to keep the data file size manageable for handheld devices that are often loaded with too many apps. Perhaps Garmin’s developers made this limitation to meet design objectives? The other limitation that I ran into was to edit an Active Captain review, the app drops you into the web based Active Captain page that requires internet access. Also, any new markers added through the Navionics app are only Navionics markers as far as I can see. 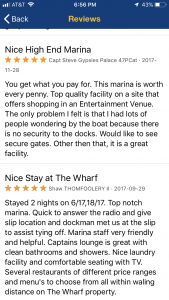 On AquaMap, you only get a couple reviews until you click on a button to get the rest – which I think it downloads when you ask. Seems like a good way to manage the data requirement. The issue you are seeing with auto routing may be that your route is too long. I generally use if for playing “what ifs” once I am underway using a route already created in Coastal Explorer. There is limit as to ho many way points it can add. I always plan my routes in Coastal Explorer, and have the iPad as a secondary source and tool. I use Auto route almost every day. . Been using it as a “what if and when to arrive at a bridge” tool for about 10,000 miles so far. Yes, three if you find the icon you want on the chart. Many more clicks if you want a list of nearby stations to choose from. I downloaded the new app 10 days ago and paid for an updated subscription. Today I do not have the AC data any more, it wants me to transfer all my old charts and get new subscription again. I know you are not with Navionics but have you heard of others with this issue too? I have no idea about your problem, but having chatted online with Navionics, they seemed to be very responsive! You’re right, Tom, and I am very happy NOT to be rolling out a simultaneous feature update and app migration to hundreds of thousands of users around the world! 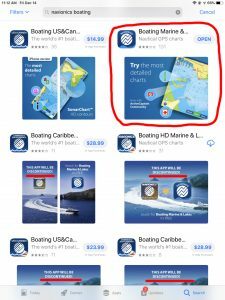 At any rate, if you look at recent comments in the Google Play or Apple app stores, it does seem like a few Navionics users think they have to pay again for chart and feature access they’ve already bought. But I think it’s just confusion. Installing a new app is not like updating an old one. The new Navionics app can not know anything about your previous purchases and subscriptions until you log into your account (and there may also be a way the old app can transfer your data and ID to the new app, though I haven’t experienced that). I dare say that Navionics support lines are busy but good to hear from Hartley that they are trying to help with the transition. Ben, IT seems to have straightened out now. I merely shut it down and waited 24 hours. It is working correctly. I was an early fan of Aquamap, like Bob Sherer; a very clever and useful app. However, come to learn that it is not available for Mexico, where my boat is currently located. So Navionics (with ACC) is what I will be running on all my devices there.